Since I was 18 years old, I’ve been a specialist nurse. I used to play basketball, I worked for a health institution (IMSS) and I loved helping people. But, 30 years ago, I had an accident and injured three of my cervical vertebrae, so I had to undergo surgery. Thank God everything went fine, but, afterward, I carried on with a limited life. I never played sports again, which caused me to gain weight. Ten years ago, I injured the same three cervical vertebrae and had to undergo another surgery. This surgery almost cost me my life, because of complications from obesity, my age and not having the means for a private surgery. My life took an enormous turnaround when I started to depend on everyone else for everything. I was under medication and had to wear a collar, 24/7. I had circulatory problems, and couldn’t walk without feeling pain. I became depressed. The only things that kept me standing were my two treasures: my children, and the fact that I had to support them through college. Looking for a solution, I worked with several bariatric doctors, a nutritionist and had reductive massage therapy, but never got results. Two years and eight months ago I received a phone call from my family telling me they could help me with my weight. 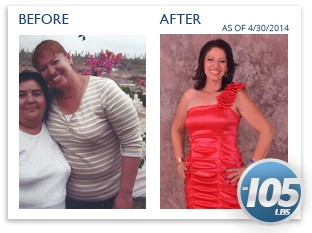 At first, it seemed impossible to lose the weight, since I had already tried everything and they all failed. Nevertheless, I trusted my sister, Dr. Elvia Felix, and I let her guide me. On August 3rd, 2011 I bought YOR Health’s largest set, as well as two more sets for my children. 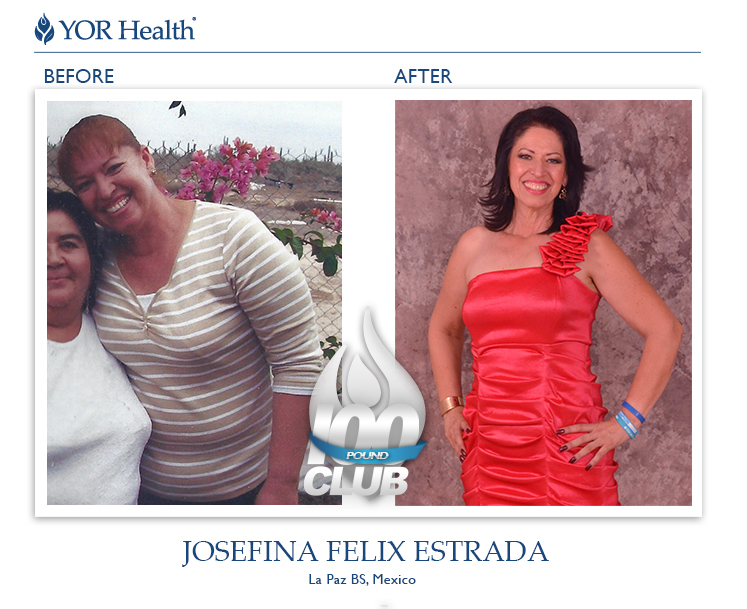 When I started taking the products I weighed 133.70 kg / 294.76 lb. At that point I was wearing size 2X. Currently, I weigh 86.40 kg / 190.48 lb. I lost 47.30 kg / 104.28 lb., without even exercising, because my spinal injury wouldn’t allow it. I felt amazing changes within my first week. I had the habit of drinking up to two liters of cola soda a day – but not now. I don’t need it anymore! Before, I didn’t like taking pictures because of my weight, but I loved the fact that I could win free products for having the best results in “The Challenge.” So, I started taking pictures of my progress. Now, I let people take all the pictures of me that they want! I feel happy and grateful for being part of a change that started within myself and also for raising awareness among others. The way I take the products is very simple. I start my day at 6:00 am with YOR Repair (two in the morning and two at night). I love it! It is my favorite because it has helped ease my pain. At the same moment, upon rising, I take 2 YOR Probiotic capsules which have helped me with my bowel movements. YOR SuperGreens is also one of my favorites. I mix it with water and take it on an empty stomach. It has also helped me with my bowel movements. I take 2 YOR Essential Vitamins in the morning on an empty stomach, along with 2 with my lunch and 2 at night. They have helped my skin stay hydrated, and I feel and look younger. The cramps I used to have all the time are also gone. For breakfast, I have my YOR Shake. Delicious! I mix 2 scoops with 1 scoop of YOR Fiber Plus which has helped me lose weight and flatten my stomach. I no longer have the craving of eating 6 flour tortillas (like I used to have) for breakfast. At mid-morning I have a YOR Berry Blast. Tasty! I mix it in 250 ml of water. I know this product has helped because I no longer crave the 10 cups of coffee I used to drink during the day, and I no longer need the two liters of cola soda to wake up. Berry Blast gives me energy and I love that it keeps the weight off. I don’t restrict myself from anything at lunch – I eat everything! But I never skip my favorites, YOR Digest Ultra. I take 2 at lunch and with my dinner after my second bite. I am so happy with not needing to follow a diet that restricts my meals or makes me weigh and count my food! Lastly, if I don’t go out for dinner, I have my YOR Shake with YOR Fiber Plus, again. At first, I didn’t understand this great opportunity, like the blind that can’t see. But, because it is his decision, now I wish everybody knew about this way of living with health. I will never stop being so grateful for having it in my life. There is nothing left except for me to thank everyone involved in this change, my family; my sister, Elvia Felix; my niece and nephews, Karen Uriarte, David R Uriarte and Armando Uriarte, for giving me this opportunity to be part of this beautiful company and to transform myself. I thank Dennis Wong, the owner of the company, for creating a worldwide transformation by helping families to have health, if they wish for it. God bless you all, always! I will keep giving my best to help raise awareness in others, to make a change in society and to share happiness.